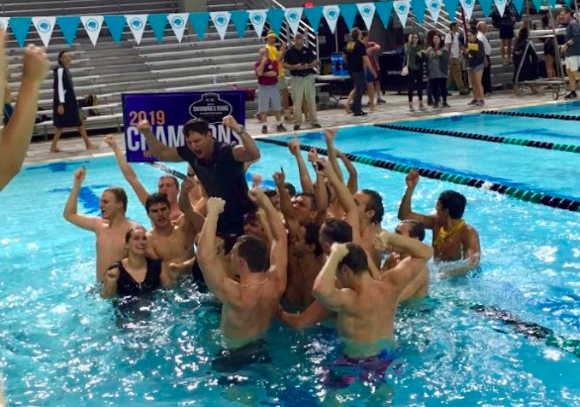 On February 13th-16th, SU Pirates Swimming and Diving took on the Southern Collegiate Athletic Conference Championships at Palo Alto College in San Antonio, Texas. This meet took place over the course of four days, three of which included preliminary and final racing sessions. The meet was organized to where individuals would swim in the morning, during the preliminary session, and would post a time for finals which could seat them into one of two heats at night. The two heats during the finals session included an A final heat consisting of individuals with times 1st-8th and a B final heat consisting of individuals with times 9th-16th. The meet began on Wednesday February 13th with the Women’s 200 Medley Relay followed by the Men’s Relay. This session was a finals session where the events would only be swam once. Southwesterns women’s A Relay took first place with a time of 1:46.02 and Southwesterns men’s A Relay also took first place with a time of 1:32.04! After the Medley Relay the 800 Freestyle Relay took place. Southwesterns men’s A Relay took first place with a time of 6:47.84! The second day of the meet commenced with the Women’s 500 Freestyle. In the finals session, Ashley Harmon and Natalie Gierat placed second and sixth with times of 5:07.83 and 5:20.56 respectively. On the men’s side, Southwestern sweeped 3rd through 5th with Peter Robinson in 3rd with a time of 4:39.11. In the finals session of the 200 Freestyle Relay, Southwesterns Women’s A Relay took first place with a time of 1:36.92. In the Women’s 200 Individual Medley, Rehgan Hartsell took first place with a time of 2:08.84. On the men’s side, Dylan Neumann took eighth place with a time of 1:58.38. In the women’s 50 Freestyle, Jesse Stovall, Cara Chin, and Catherine Hiebel took first, fourth, and eighth places with times of 23.79, 25.04, and 25.54 respectively. On the men’s side, Keith Gill, Carl-Ake Willberg, Todd Coachman, and Caleb Pfeifer took first, sixth, seventh, and eighth places (with times of 20.77, 21.55, 21.58, 21.61 respectively). On the third night of racing, the meet began with the 400 Individual Medley. On the women’s side, Brielle Adolph placed fourth with a time of 4:49.67. On the men’s side, Matthew Oevermann, Caden Garza, Sean Calvert, and Nathan Seager placed fourth, fifth, sixth, and eighth (with times of 4:13.30, 4:22.49, 4:23.93, and 4:28.26 respectively). In the 100 Butterfly, on the women’s side, Jesse Stovall and Erika Dubros placed first and sixth with times of 57.19 and 1:00.61 respectively. On the men’s side, Keith Gill, Dylann Neumann, and Connor Moland placed second, fifth and sixth with times of 50.54, 51.55, and 51.57 respectively. In the 200 Freestyle, on the women’s side, Natalie Gierat placed fifth with a time of 1:58.35. On the men’s side, Peter Robinson, Todd Coachman, and Mario Foltz placed first, fourth, and eighth place with times of 1:40.67, 1:42.69, and 1:46.44 respectively. In the 100 Breaststroke, on the women’s side, Rehgan Hartsell and Erika Dubros placed first and fifth with times of 1:04.69 and 1:09.17 respectively. On the men’s side, Alek Argueta and Sean Calvert placed first and sixth with times of 56.97 and 58.99 respectively. In the 100 Backstroke, Megan Mick placed seventh with a time of 1:01.83. On the men’s side, Carl-Ake Willberg and Connor Moland placed third and fourth with times of 52.16 and 52.24 respectively. The last race of the night included the 400 Medley Relay where both of Southwesterns A men and womens relays placed first with times of 3:56.30 and 3:23.93 respectively. The last night of racing began on Saturday with the 1650 Freestyle or otherwise called the mile. On the women’s side Ashley Harmon won first place with a time of 17:30.78. On the men’s side, Matthew Oevermann, Nathan Seager, Logan Davis, and Colton Creasey placed second, fourth, sixth, and eighth places (with times of 16:24.38, 16:57.79, 17:05.52, and 17:29.97 respectively). In the 200 Backstroke, Megan Mick placed eighth with a time of 2:16.87. On the men’s side, Peter Robinson and Connor Moland placed second and seventh with times of 1:50.95 and 1:59.46 respectively. In the 100 Freestyle, Jesse Stovall placed first with a time of 51.49. On the men’s side, Keith Gill, Carl-Ake Willberg, and Todd Coachman placed first, third, and sixth with times of 45.72, 46.56, and 46.99 respectively. In the 200 Breast, Rehgan Hartsell and Natalie Gierat placed first and fourth with times of 2:21.86 and 2:31.06 respectively. On the men’s side, Alek Argueta and Sean Calvert placed first and third with times of 2:05.42 and 2:09.80 respectively. In the 200 Fly, Ashley Harmon and Summer Newton placed first and fifth with times of 2:07.74 and 2:18.81 respectively. On the men’s side, Dylan Neumann, Caleb Pfeifer, and Avery Doolittle placed fourth, sixth, and eighth places with times of 1:55.10, 1:55.10, and 2:03.94 respectively. In the last relay of the meet, the 400 Freestyle Relay, Southwesterns women’s A relay placed second with a time of 3:31.88. On the men’s side, Southwesterns men’s A relay placed first with a time of 3:04.39. In the women’s 3M and 1M diving, Kyla Gorman placed sixth and seventh with combined point scores of 258.60 and 278.65 respectively. Overall the Pirates gave an amazing performance in all of their races and supported each others from the beginning! 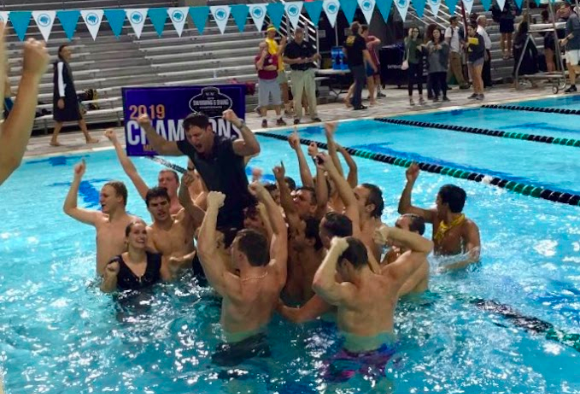 The Men’s Swimming and Diving team placed first overall in the meet with a combined score of 884 points, the first time in the programs history! On the women’s side, the women’s team placed third with a combined score of 703 points! Two Southwestern Women, Rehgan Hartsell and Jesse Stovall, both tied for the female high point winner of the meet and share the award! Three Pirates all nabbed NCAA B cuts including Ashley Harmon, Jesse Stovall and Rehgan Hartsell. Lastly, the Southwestern Swimming and Diving coaches won the SCAC Men’s Swimming and Diving Coaching staff of the year!